A dishwasher is a big part of the family, so finding the best one to suit your home and circumstances is crucial. The Electrolux ComfortLift Dishwasher is arguably the easiest dishwasher to use. It’s designed with a unique system that lets you lift the lower rack upwards when loading and unloading. It sounds ideal for elderly people or those with back problems, but is it worth the extra cost? Read on for a full review to find out. What is the Electrolux ComfortLift Dishwasher? How does the ComfortLift work? The ComfortLift is a fairly simple mechanism and is only found on the lower basket of the dishwasher. To pull it up, you use the lever on the side, and to bring it back down you pull the trigger and slide it back into place. The ‘ComfortRails’ is claimed to provide a ‘gentle’ stop without rattling plates. It’s stated to work the smoothest with loads of 7-10kg and has been tested for 20,000 loaded cycles. The maximum load capacity of the ComfortLift is 18kg. The inverter system has a 44 dBA operation noise level. Most dishwashers range between 36 and 64 dBA, so the Electrolux model sits towards the quiet side of the spectrum. To give an example, a library registers around 40dBA, which is fairly quiet. Whether this is a huge consideration is up to you, perhaps the performance and price is more important in particular if your kitchen is far away from you bedroom. The ComfortLift dishwasher has a stainless steel finish and is 596 x 570 x 818mm (W x D x H) in size. On average, dishwashers range from 450mm to 600mm in width. It’s important to check if the dishwasher will fit the space you have in your kitchen. The ComfortLift is boasted to have 25% more capacity than an average dishwasher, fitting in large bulky items that usually struggle to fit in. The capacity of dishwashers is referred to in ‘place settings’. The more place settings a dishwasher has, the more dishes it can fit. With 14 place settings in the Electrolux ComfortLift, you’re hitting the mark for a family sized dishwasher. As a rough guide, the table below gives the number of place settings required per the number of people in a household. If you’re living on your own, a single drawer dishwasher may be an alternative. ‘MyFavourite’: allows you to program settings you use regularly. ‘ECO’ wash: an economy wash that helps to decrease energy consumption by washing loads in up to 50% less time. ‘FlexiWash’: allows you to program different settings for the upper and lower baskets. It may be useful for when you have an extra grimy baked dish stacked at the bottom and lightly soiled items such as cups at the top. ‘TimeSaver’: helps cut time of a cycle so that it’s ready at a time you need it, designed for busy lifestyles. Intensive program: increases the pressure and water temperature. ‘XtraDry’ system: stated to boost the drying performance. 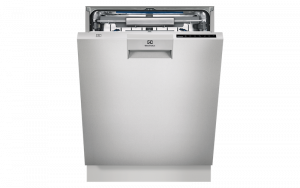 The ComfortLift dishwasher features wine glass holders, fold down tines and third racks for cutlery. The ‘SoftGrip’ and ‘SoftSpikes’ wine glass holder helps keep glasses firmly in place from the stem to the rim. It’s especially useful when you go to unload the dishes. You can fit up to eight wine glasses in the holder. It also features a cutlery tray that can be removed to fit in a baking tray instead. AirDry: automatically opens the dishwasher by 10cm at the end of a wash cycle for “naturally inspired drying”. It stays open until you unload. 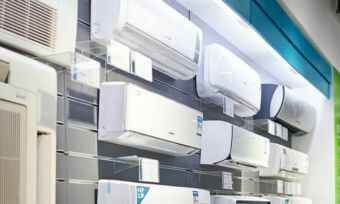 This system is claimed to help reduce on energy costs. FlexiSpray arm: boasting five spray levels for efficient water coverage no matter how the dishes are loaded. While you might still need to restack some dishes – like bowls the wrong side down – it may help to not need as much movement in crowded areas as the spray arms are stated to move in multiple directions instead of one way. Light beam on floor indicator: a red colour lights up for the duration of a program and goes green when it’s done. The red light also flashes if there is malfunction. As the door opens at the end of the cycle with the ‘AirDry’ system, the green light is said to not be as visible. While this defeats the purpose of having a light, you can deactivate the AirDry system or simply check the control panel for when it’s done. With the extra hyped technology, you may be wondering how much a family sized dishwasher will really cost you. The ComfortLift dishwasher uses 287kWh a year and you could expect to spend around $82 to run it annually (based on an electricity usage price of 28c/kWh and one wash cycle per day). This doesn’t include water costs. Should I buy the Electrolux ComfortLift Dishwasher? If you find it difficult to reach plates in the lower basket of the dishwasher, then the ComfortLift may be for you. It may be particularly useful for tall people or the elderly as it reduces the number of times you need to bend over. With this in mind, anyone who suffers with back pain could benefit from an easier to use dishwasher. When choosing the right dishwasher for your home, it’s important to consider its size and whether it will suit your needs. The ComfortLift is a family-sized dishwasher with a 14 place setting design. If you’re a household of 1-2 people, this might be slightly large unless it can make life easier for you when hosting dinner parties. Also consider the extra cost. With a recommended price of more than $1,600, it’s double the cost of some dishwashers on the market. If you don’t get true value from the ComfortLift, it could just be a waste of money. If you won’t use its standout basket-lifting feature, it’s probably not for you. But if you will make use of it, it could be money well spent.